Home Uncategorized Lights, Camera, Traction! Star Waggons builds each trailer—such as this Single Slide Cast model—from the ground up, from welding the chassis to stitching the upholstery. Stake-bed trucks are most often used to tow the rolling condos, which each weigh about 12,000 pounds. The compact kitchen includes a microwave and refrigerator. Special requests can also be made—one of the most outlandish was for an indoor lap pool. Designers sketched out plans, but studio executives killed the idea. The interiors generally have a beige color scheme, accented with mahogany-colored paneling. Some of the newer units are styled to resemble hotel rooms, with carpeting and bleached beechwood floors. A Generac generator fueled by a 27-gallon tank provides enough juice to run a 42-inch LCD TV (with satellite dish) and a 13,500 BTU air conditioner as well as heat 45 gallons of fresh water that’s stored in the chassis. Size reflects status: Many shows start by renting rigs with modest digs. Three actors might share three-room trailers, then switch to two-room trailers for two actors. As the show grows, so do the Waggons. Lead actors eventually get private on-set lairs. 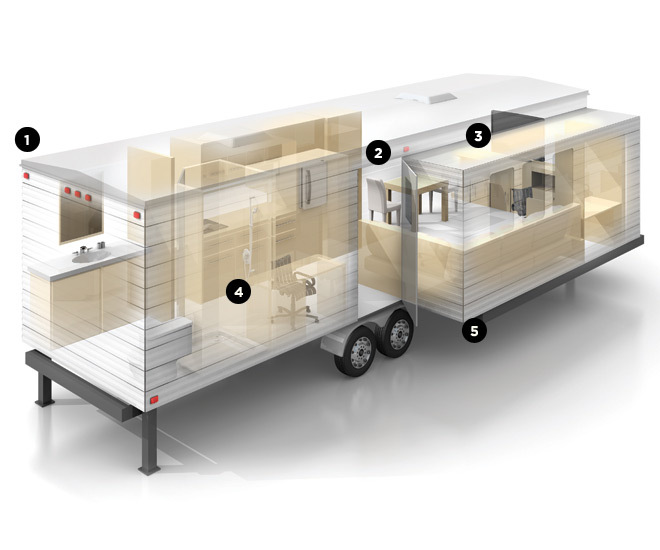 A full-amenities trailer rents for $1,200 to $2,500 a week. Star Waggons tries to keep things as waste free as possible. It has used recycled wood for furnishings and recycled car tires as flooring. Some trailers are powered by solar panels.